​Jurgen Klopp reserved special praise for Naby Keita after the Liverpool midfielder produced the best performance of his nascent Premier League career on Saturday. 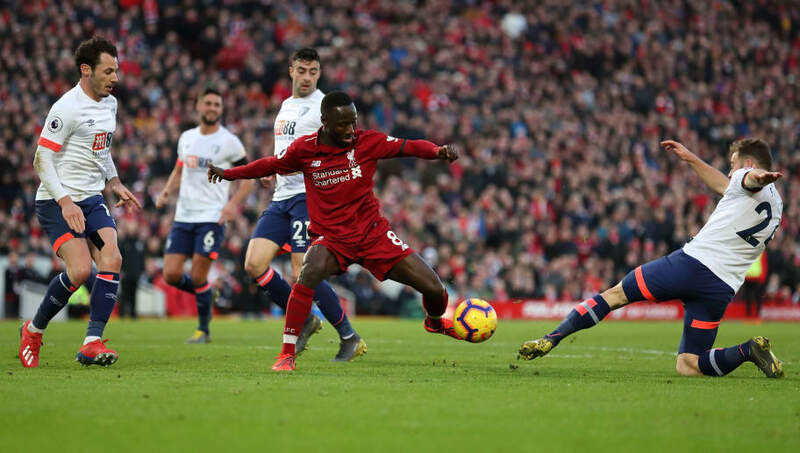 Keita commanded the midfield all afternoon against Bournemouth and played a part in all three goals, including a sublime ball with the outside of his foot to Roberto Firmino in the build-up to Liverpool's third. This came just five days after he struggled to impose himself in the draw at West Ham, but Klopp was delighted that ​Keita repaid his faith with a classy display. "You need a good performance. The second half against West Ham was good, the first half wasn’t that good but the second half was really good," Klopp told ​Liverpoolfc.com. "If you fall into a little hole you have to make sure you get out by yourself. That’s what he did in the second half at West Ham and it was clear this game would be the next step for him. "It was really nice to see that game and see how the people appreciate it. He is in a lot of situations, passing these little balls through a really tight midfield. It’s just good. And there’s a lot more to come. That was a good one." ​Liverpool signed Keita from RB Leipzig for £52.75m but he has not yet caught up to the pace of the English game, despite showing promise in his early Premier League outings. But on Saturday he made more touches (120), passes in the opposition half (63), possession gains (12) and tackles (7) than any other Liverpool player. He will be needed in the remainder of the season as Liverpool attempt to balance a title challenge with a Champions League campaign, which resumes against Bayern Munich next week.